Continuing their takeover of the West End, Mischief Theatre prove once again that they are well worthy of their Olivier Award, with The Comedy About a Bank Robbery stealing the hearts, and laughs, of London. Whilst The Play That Goes Wrong books into its third year, it seems the LAMDA graduates have discovered a lucrative brand that appeals to even the most sour-faced theatregoer. Previously the company have heralded the slapstick “Goes Wrong” series, which includes a variety of stage-related mishaps, but Bank Robbery is an altogether more daring project. 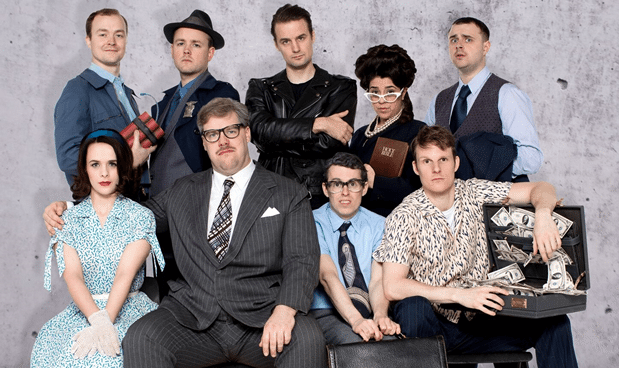 A traditional farce that follows a group of criminals in pursuit of a well-guarded diamond, Mischief's new comedy combines only the cleverest of on stage tricks, including an unbelievable scene that gives a birds-eye perspective of an office, with two actors suspended vertically on the back wall of the theatre. The pure inventiveness and innovation behind this play is what makes it such a blinding success. In fact, it is clear that the company started as Fringe theatre, as they make the most of every transition with not a blackout in sight. Mark Bell's direction ensures that there is not a moment for pause, as the actors become cars, seagulls and even a 50's band, all with brilliant vocal interludes, particularly from the impressive Nancy Wallinger. Bank Robbery includes a larger pool of actors, with newcomer Jeremy Lloyd absolutely stealing the show as the overworked, distressed Officer Randal Shuck. Dave Hearn provides a pant-wettingly funny turn as Sam Monaghan, particularly in the scene when he switches between Robin Freeboys and the maintenance man. Every single cast member is exceptional, with the ensemble work even more satisfying. David Farley's set provides the perfect backdrop for this ensemble heavy show, and it really lets the actors do the work in a way that the “Goes Wrong” sets perhaps do not. There's so much you could say about how hilariously wonderful this play is. A completely refreshing genre to have in the West End, you can only wish Mischief Theatre the utmost success in their entirely original branding, which is proving to be wildly entertaining and exceptionally popular.